I got a surprise in the mail this weekend. It was my February Birchbox, which normally arrives way later than this. Birchbox finally decided to drop Streamlite, which is an extremely slow shipment company. They used UPS Innovations this month, which is when Birchbox drops it off at UPS and then UPS delivers it to a USPS close to you. My box was shipped on the 8th, and delivered on the 11th. *Can't wait to use this! *It was okay? I don't see what the big deal was over this. It works, but so does applying normally. I will keep using it to see if I get impressed. *I have never heard of this, but will give it a try. *It is a super soft way to cleanse your face. I like it, but would not pay high dollar for it. *Looks pretty awesome. Has 4 choices so this is the full size offered. Yay! *The smallest sample ever. I keep wanting Jouer products as samples from Birchbox but they are itty bitty where you can't really try the product before you decide to buy it. *Pretty, but very light coverage. I would not use this in everyday life. *Super cute, I needed a new nail file to put in my purse. Thanks Birchbox! *Never heard of this band and they are from my area. Will listen and decide if I should download. I was super excited to see the beauty blender in my box. I can't wait to try it out. I got teh beauty blender and eye rock as well! I've started to try it out so far, but I'm still testing it. Can't wait to hear your thoughts as well. And I agree on the Jouer samples. They are always so tiny. Especially with this one. 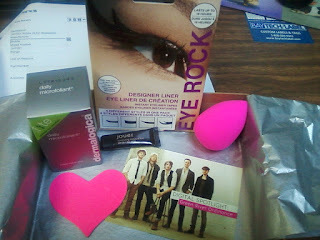 Let me know what you think of the beauty blender and the eye rock! I'm always bummed about the size they send for Jouer, it looks like it might be a decent brand, but I have no clue since I can't actually try the products for a few days.